Here are some of our favourite websites for getting to know New Zealand species. If your favourite site is not on our list, please let us know at info@inaturalist.nz. The authoritative online encyclopaedia of all NZ birds, complete with photos and sounds. A short online self-guided course from the Department of Conservation. The Department of Conservation's information on NZ geckos, skinks and frogs. A website on the NZ frogs from the University of Otago's NZ Frog Research Group. A web guide to NZ galaxiid fish (like whitebait). Lots of information on NZ freshwater fish from NZ's National Institute for Water and Atmospheric Research. NZPCN has an extensive set of fact sheets for NZ plants. Manaaki Whenua — Landcare Research staff have built many excellent online keys to different groups of plants, including Coprosma, orchids, grasses, weeds, and all flowering plant genera. The website of the NZ orchid group, with lots of information about the species. Kerry Harrington's guide to many common NZ weeds. Learn about the native plants most suitable to plant in your area of NZ. See distribution maps of herbarium specimens in Australia and New Zealand. All of the Flora series books are full text online at the Flora of New Zealand (beware the technical botanical jargon) and a regularly updated eFlora of NZ is at New Zealand Flora. All of the standard plant monitoring data are available through NVS, plus a lot of documentation on the standard NZ methods for plant monitoring. All the notable trees in NZ as officially recognised by the New Zealand Tree Register (NZTR). Manaaki Whenua — Landcare Research's beginners' guide to insects and other terrestrial invertebrates. Search on NZ plants and get a list of the insects found on them, or vice versa. A gallery of lots of the larger moths of New Zealand. Robert Arter-Williamson's guide to all the New Zealand butterflies and their natural history. This site includes lots of sound recordings as well as photos. An interactive identification key for NZ cicadas. 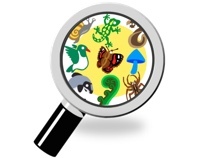 Free and full text searchable access to PDFs of all the important publications in NZ entomology. Manaaki Whenua — Landcare Research's beginner's guide to identifying fungi. Clive Shirley's amazing guide to NZ fungi. Manaaki Whenua — Landcare Research's database with information on all fungi, plant associated bacteria and viruses. You will need to know the scientific name to look something up. Jerry Cooper is a mycologist at Manaaki Whenua — Landcare Research. His iNaturalist NZ journal includes helpful posts about the identification of many NZ fungi, including ink caps, amanitas, and many more. The University of Otago's resources for learning about marine species, including the Marine Metre Squared project for citizen science monitoring of tide pools. The informative website on sea life from the Seafriends Marine Conservation and Education Centre in Leigh, Auckland. Andrew Spurgeon's useful and extensive guide to NZ molluscs. NZOR lists all NZ species. You can see a species' taxonomic information and whether or not it's native. You can also batch upload a list of species and NZOR with attempt to automatically match them all to current names. You also download lists of species names. GBIF contains information on the occurrence of organisms harvested in real-time from many databases within New Zealand and elsewhere in the world. It includes 'research grade' observations from iNaturalist NZ.